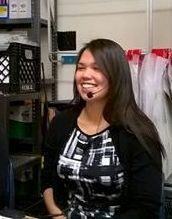 Soundfield equipment was successfully installed: 21 in Igloolik and 24 in Nakasuk schools. SSA’s, teachers and administration were trained, enthusiastically adopting the new equipment and welcoming the attention for hearing loss. Jennifer McGee, the new Student Support Consultant was a crucial contributor in this launch given that she will be the lead in launching the next three communities. At the Iqaluit launch we were pleased to welcome school administrators, Department of Education staff, ECE students from Nunavut Arctic College, government officials, DEA representatives and politicians. We were very pleased to welcome Peter Williamson, Constituency Assistant for Hunter Tootoo. SSA’s were enthusiastic to become soundfield system experts for their schools. 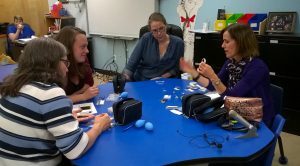 Lynne discussed troubleshooting hearing aids with teachers. 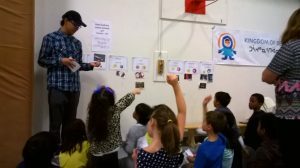 At the Hearing Fair, Sam asked the children, “How loud are these sounds?” as they discussed the broad range of noise levels, from rifle shots to pin drops. 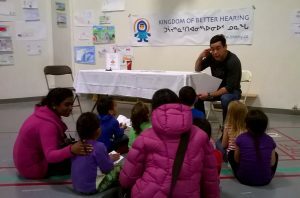 Also at the Hearing Fair, Keith talked with the children about ear care, what is good for their ears and what is bad. The children were very engaged. Improved audiology support is vital in the north. Bheny is helping where we can but many more aspects need addressed.